Earth Mantra listeners know that we are big fans of the work of Nick Fortune, aka Susperia-Electrica, having released two of his albums, both in 2010. Consequently, we are very honored to announce his triumphant return, as well as his first release of 2011 on our humble netlabel: a luxurious collection of dazzling space music called A World Beyond Our Own. Space music is one of those genres that, when done right, can elevate the spirit and expand the mind, opening up possibilities and vistas that transcend the ordinary world. Measured against this scale, A World Beyond Our Own both satisfies and delights, providing all the expansiveness a lover of space music craves while also delivering a delicious subtlety and sophistication that any music lover will appreciate. As typical of Nick's work, the sound design leaves a deep impression, both lush and refined, making full use of the sound stage and somehow conveying an impression of three-dimensional depth. Immaculate. But sound sculpture alone is not enough. The best space music marries the sounds themselves with inspired compositions, yielding results that are as musically satisfying as aurally stimulating. The ambient subgenre of space music is particularly challenging, if only because ambient composition itself is so difficult to do well. Here is where Susperia-Electrica truly shines. One certainly can imagine listening to this remarkable album while laying back in a planetarium seat, or as the soundtrack to a space voyage film; but one can just as easily imagine listening to the album actively in a darkened room with headphones as a standalone work of music unto itself. One can also even imagine the music as providing a sonic backdrop to an art installation, or simply as background music for the work day. This is why we are so impressed by Nick Fortune, and particularly by A World Beyond Our Own. His music succeeds both as space music, ambient composition, and as passive mood music, a very difficult trifecta to hit -- but Nick makes it look easy. We think that there is something for nearly everyone to love in this release, and encourage all of our audience to give it a listen. Simply magnificent work. 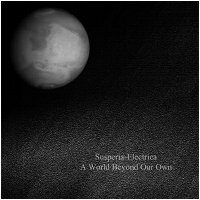 So with great pleasure, Earth Mantra unveils A World Beyond Our Own, the latest release by Susperia-Electrica. Highly, highly recommended. I wanted to say thanks for the music. I've known about your compositions thanks to Youtube. The first one was "Endless galaxy", which I put my very first compilation of cosmic music ! Right now I've just downloaded this album, and it's really great. I enjoy it as much as other works, even by paid artists. Drifting away seamlessly. This is a lovely piece of work and makes for a most relaxing and enjoyable listen. Turn off the lights and float away. While I definitely have enjoyed Nick’s music in the past, I definitely feel that A World Beyond Our Own is his most coherent and satisfying work to date, both sonically and compositionally. The warmth of the synth textures is just remarkable and he shows a sensitive ear to nuance and dynamics. Beautiful, flawless album. What I like about Susperia-Electrica's music is that all tracks are consistent and carry the same or similar ethereal and dreamy mood.